Mammoth Mountain is located outside the town of Mammoth Lakes California in the Central-Eastern part of the state about 300 miles from Los Angeles. Mammoth Mountain is located in Mono County near Yosemite National Park (closed in winter) and about 165 miles South of Lake Tahoe. The drive from Los Angeles covers the California high desert to the Sierra Mountains. The transition from the desert to high mountains is a gradually changing scenic and interesting drive. The drive along highway 395 will take you past the Beverly and Jim Rogers Museum of Lone Pine Film History. The area was once a popular location for filming westerns. The Dow Hotel on Main Street in Lone Pine hosted many of those film stars like Gene Autry, Errol Flynn, Robert Michum and Wayne Rogers. As you travel North of Lone Pine California, you will pass the former Manzanar War Relocation Center where thousands of people of Japanese descent were interned. It is the landmark with the wooden tower, stone guard stations, a pale green gymnasium and a few scattered buildings. This is where over 10,000 Japanese and Japanese Americans were interned during World War II. The center was closed in 1945. South of Bishop California you will approach the turn-off for the Keough's Hot Springs at the foot of the Sierra Nevada's. Established in 1919, with it's heyday in the 20's and 30's, it is the largest natural hot springs pool in the Eastern Sierra. The greater area is home to many lakes popular with the anglers during the summer months (Convict Lake, Crowley Lake, Silver Lake, Lake Mary, Twin Lakes, June Lake and of course Mammoth Lakes). 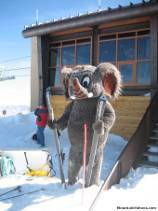 Continuing about an hour North of Bishop you will encounter your destination of Mammoth Lakes California, home to Mammoth Mountain ski resort. Most of the skiers at Mammoth drove five to seven hours from the Southern California population centers of Los Angeles and San Diego. Note: The towns of Lone Pine, Independence, Big Pine and Bishop are know speed traps. Mammoth Mountain has parking at the base area of the mountain and along the access roads. It is typical on the weekends to have the lots fill up forcing one to park along the access road. One has the option to walk or wait for a shuttle. There are multiple shuttle to pick you up and transport you between base areas or to pick-up or drop-off along the road. It is preferred that one leave the vehicle at the condo or hotel and take the free town shuttle. Mammoth Yosemite Airport: (MMH) Local airport mostly for small private aircraft. Also served by United Airlines and Horizon/Alaska Air from Los Angeles (LAX), Orange County (SNA), San Diego (SAN), San Jose (SJC) and San Francisco (SFO). Private aircraft available from Hot Creek Aviation. 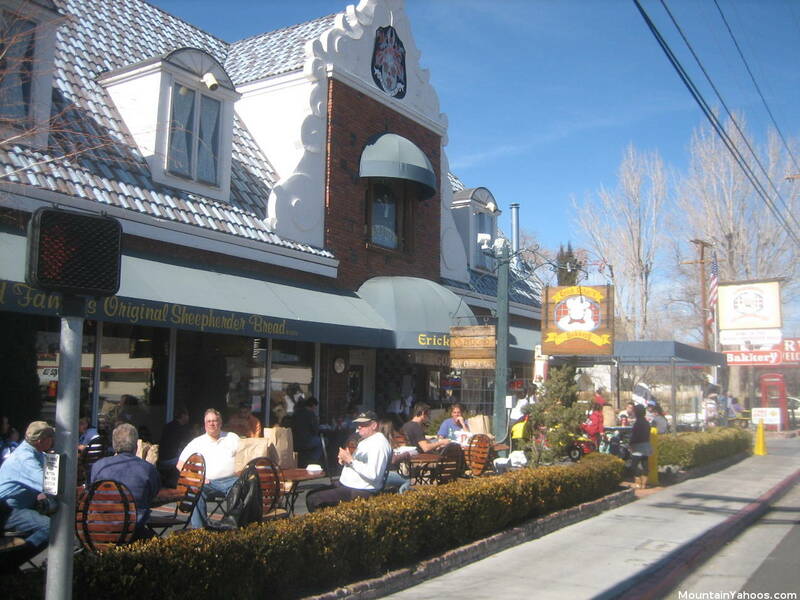 Schats's Bakery in the town of Bishop, is a traditional stop on the way home to pick up some food for the ride home. This Dutch themed bakery is a source for cinnamon bread, dark volkoren bread, mule bread, beer bread, sourdough bread, sheepherder bread, ... and for fresh sandwiches.